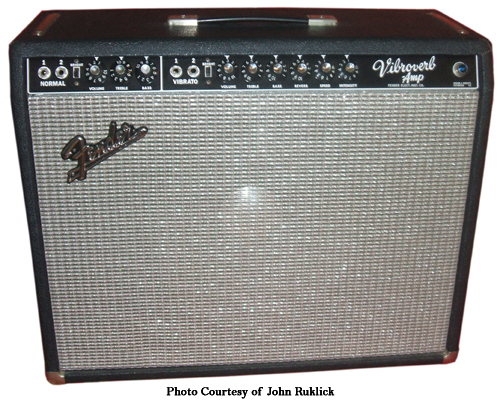 Comments: The Vibroverb was retired in 1964. The Vibroverb sounds so beautiful! I had my “Fender Custom Vibrolux Reverb” circuit converted to the Vibroverb circuit. What a difference! No wonder SRV played thru 2 of these along with his other amps in his arsenal. Im going to build a clone bwhahaaaa…. I think that the size (height) is not correct. It is 20″ high, not 19 and the strap are large 5 5/8″. I have one of these with a JBL D130.